Action Play Systems is the preferred vendor for playground dealers nationwide. Action Play Systems focuses on playground accessories such as playground borders, ADA ramp systems, wear mats for high traffic areas and more. Our 8" and 12" playground borders feature a symmetrical design on the front and our exclusive "Surfacing Guide" on the back. This patent pending surfacing guide features marks at 1" - 7" intervals on our 8" borders and 1" - 11" intervals on our 12" borders providing a quick visual reminder to assist in ensuring adequate levels of safety surfacing are maintained. Additionally, Action Play Systems offers two universal ADA/Wheelchair Accessible ramp systems. Both our APS-ADAFullRamp and our APS-ADAHalfRamp mount independent of playground borders; making them the industry's only "true" universal ramp system. They work great with our borders; however, are equally as good when installing on a playground that may have an existing border system. Action Play Systems also has an extensive line of replacement swing parts, swing and slide wear mats and more. Action Play Systems is a wholesale company only; APS DOES NOT sell direct to the end user. 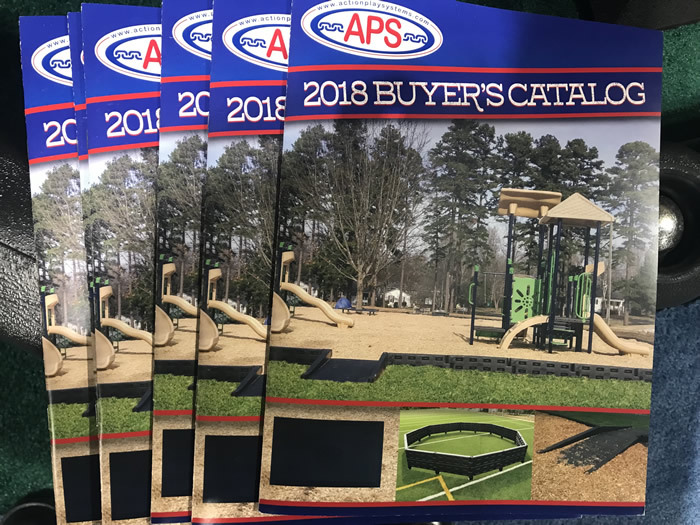 If you are a School, Church, Daycare, Municipality looking for new playground equipment or just interested in learning more about our products; please contact us today and we'll be happy to get you in touch with one of our many approved dealers across the United States. We strive to provide the best lead times, service and quality for our products within the industry. Thank you for visiting our site and feel free to look around and contact us with any questions.